The North Pk is Pt 2284, not Pt 2324 as shown on the topomap. Follow the rock buttress from upper Cirque Creek on the left side of a gully, crossing to the right and up a snow couloir higher up to gain the North Ridge. Reasonable rock, but grassy. Long mellow sections of narrow couloir with frequent steps to the snowfield. Move right and finish up the couloir of the Miller McCallum line. 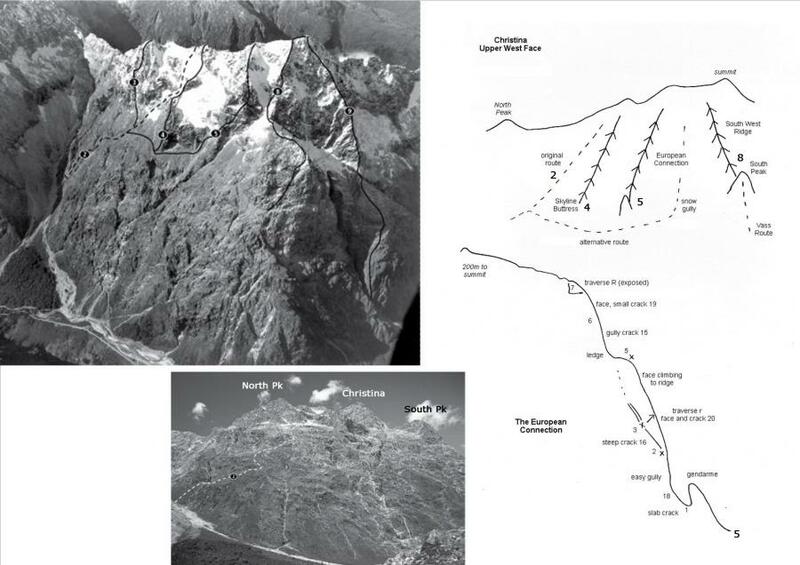 Starting as for the Original west face route until the first cleft, moving into a broad gully where possible. The route trends left out of the gully at points to avoid steep ground but never strays from it entirely. At about half height traverse some bulges, committing moves left, before regaining the gully and summit. A long 1200m ice climb. Descend via the Original Route; note that this involves tricky route finding and unstable snow late in the afternoon. "For my level of fitness and understanding of the Darrans this route was probably pushing it a bit. Diving home I woke up hitting marker posts and had to sleep a few times. Looking back with a bit more knowledge I probably had trashed blood sugar levels and was a bit hypothermic.“ – Merv English. Five pitches: 17, 16, 17, 18, 17. Climb the standard route out of Cirque Creek to the high basin left of the Skyline Buttress. To reach the start, head leftwards up into a rocky gully to the base of the West Face. You will see a pillar towering over the top of the gully. Climb up and right over this pillar and move rightwards along a ledge system, bypassing a wide crack until reaching a nice hand-crack approximately 3m further on. Angle towards the V-groove you’ll have seen from down in the gully. Sensational 40m pitch. The arty cascades that you scuttle around in summer on the way up Christina. Four pitches. Two pitches had amazing clear ice, so it felt like climbing directly on top of the rock and tussock. Descend by rapping off of the top pitch, and then sidle off the ledges on the true right. The winter of 1992 was exceptionally cold and these falls froze good and solid. They may not form that often.